Lady G. - Not Gaga, but pure glamor. 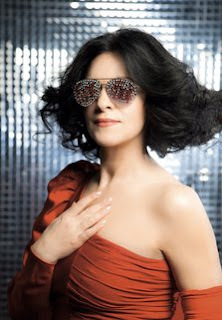 Diva Angela Gheorghiu in conversation with Richard Erkens about Berlin, verismo and cool photos. Excerpts from the interview. Ms Gheorghiu, you have come to Berlin to sing at the German Opera in the title role in "Adriana Lecouvreur," a role debut. How did you experience the Berlin premiere audience? Wunderbar! A great audience, I was very impressed. It was a real triumph! I have now for the third time in Berlin performed an opera in concert, something I rarely do. I have sung "Roméo et Juliette" here, and two years ago Mascagni’s “L'amico Fritz." But this time it was very special because it was a real debut in such a large role - and with such a wonderful team of friends and colleagues. Together with Marco Armiliato on the podium and the great and so friendly orchestra of the Deutsche Oper, we had an unforgettable evening. It is important to have such colleagues, because Cilea's score is really not easy to present. In November this opera will be seem at London's Royal Opera House in a dramatic interpretation. Here in Berlin you have therefore a kind of public dress rehearsal? No, this is not true. For opera in concert form has a completely different and distinct atmosphere that cannot be compared. And it really does not matter if I have sung the role previously, or not. As a singer you have to exert yourself in the same manner and bring yourself into a role. I have to say even that concert performances are more difficult for me because I cannot move in any stage space. Especially for a part like Adriana, where in a stage role you play an actress, this is very difficult if you must always stand in one place. The possibility of movement is very limited, and this creates a very different theatrical atmosphere. In this case this is also difficult for me because in the third act I have a real theatrical monologue. I must speak, which otherwise I only have to do in "La Traviata," when I receive the letter from the father Germont. But as Adriana I am a real actress with a spoken monologue - I love that! In London there will be a new stage production. That is important to me when I sing a role for the first time. I have had very good experience with director David McVicar, as we have worked together on "Faust". He's incredibly talented and one of my favorite directors. Therefore, I again asked him if he wants to direct the production. And my singer colleagues have agreed, of course, Jonas Kaufmann, who will come to London. You already mentioned a special feature of this role, namely as a Parisian actress Adriana, who is a historical figure, and died under mysterious circumstances in 1730. At that time there was a veritable social scandal. What attracts you in this role? I was surprised when I discovered that over half of the music for Adriana is written in double [pp] or triple [ppp] piano. I thought it would be a role for a spinto soprano. But she is not! The text is very much in the foreground. This is a feature of the role that is very important. In addition, I am fascinated by the clear distinction of the female vocal subjects: the mezzo part is clearly my competitor, Principessa di Bouillon. Cilea distinguished voice types and characters very well. Is there a need for a special vocal technique for the verismo musical category? Do you alter your vocal technique when you sing Violetta or Adriana? No, there is no difference. But now you remind me of my first verismo-role, that I played together with Plácido Domingo, namely in "Fedora" by Umberto Giordano. At that time I realized that with this repertoire, you simply have to deal more carefully with the voice. I watch that I do not go to my limits, even if it is required. Verismo is not the healthiest repertoire, you should not sing it too often. It helps if you are a bit egotistical and can behave with restraint. But then when I'm on stage, I forget all these concerns again. You mentioned "L'amico Fritz" already, just as "La Rondine," which appears directly on DVD, now follows "Adriana Lecouvreur": Are you specifically looking for less-known operas from this period? ... how about now Jonas Kaufmann. Yes, exactly. Jonas I know for a long time, from his time in Zurich. My manager gave me then a video with him and Cecilia Bartoli. They sang in 2002 Paisiello’s "Nina." I was looking for a new tenor for "La Traviata" at the Metropolitan Opera, and recently we needed someone for the "Rondine" at Covent Garden. I asked again, Peter Katona, "Let us not hesitate to take this young tenor!" And he has given his debut in London and later in New York and also at La Scala. I have driven his career really and then convinced him to leave Zurich and to make the big career. Even as we later recorded "Madama Butterfly" for EMI, it was not so easy to convince the record company for such a role as Pinkerton to commit to a tenor still not famous anywhere in the world. I am happy that they trusted me, and as you can see, I had the right ear and the right feeling! Incidentally, it was similar to Roberto Alagna: I notice quickly if someone has a special voice. You currently present yourself in an unusual up-to-date styling that is inferior in nothing to certain style icons from the pop industry. You obviously like to play with your options? I love it! I like to surround myself with beautiful things, and why should I not show it? If I have the opportunity to introduce myself as well and I look good in different outfits, then show me this way, and don’t apologize for me. Can this side of an opera star also help to address a larger, perhaps even foreign opera audience? All singing stars in the history of opera have been trying to reach a large audience. But why? We all know that especially today, classical music - specifically the opera - music does not interest everyone. But not because the opera would be the entertainment for a social elite, but just because this music is not always easy to hear and it's hard sometimes to approach it. It takes often a lot of time, not everyone has. It is not always a question of lack of training: Also a good mathematics teacher at school does not manage to be all enthusiastic about mathematics. Some light classical music appeals to all certainly, but the art form of opera is not made for everyone. This is a simple truth. Even the most tasteful thing in life is not for every day and not made for everyone. If it were, it would lose its appeal immediately. Of course, I try with my art to reach a large audience, but I do this mainly with crossover projects, so with lighter things. We cannot have the largest audience in Wagner. And man needs both: pop for the body, classical music for the soul!